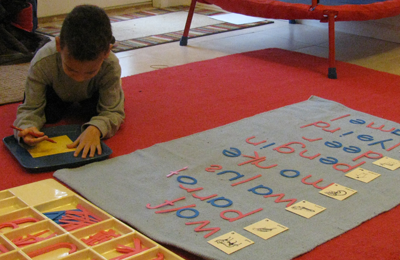 Working with the moveable alphabet is a kinetic learning experience. The multi-age classroom is beneficial to everyone. The younger child has the model of the older child and watches with great interest the higher-level work they will be doing some day. The older child has the opportunity to be the leader and to take more responsibility. The older student may even help the younger child with lessons, further reviewing for themselves, the lesson. Having the same teacher throughout these years allows the child and the teacher to develop a close relationship in the learning environment and establishes a balanced and secure consistency to the child’s day.